I was active in Cornell's chapter of ESW throughout my 4 years in college. The club's goal was to promote environmental sustainability among the engineering and larger community. I was an officer in the club starting my sophomore year, including President (2010-2011), VP of Events (2011-2012), and VP of Publicity (2009-2010). The main ESW projects were The Drive Not To Drive and the North Campus Resources Battle. 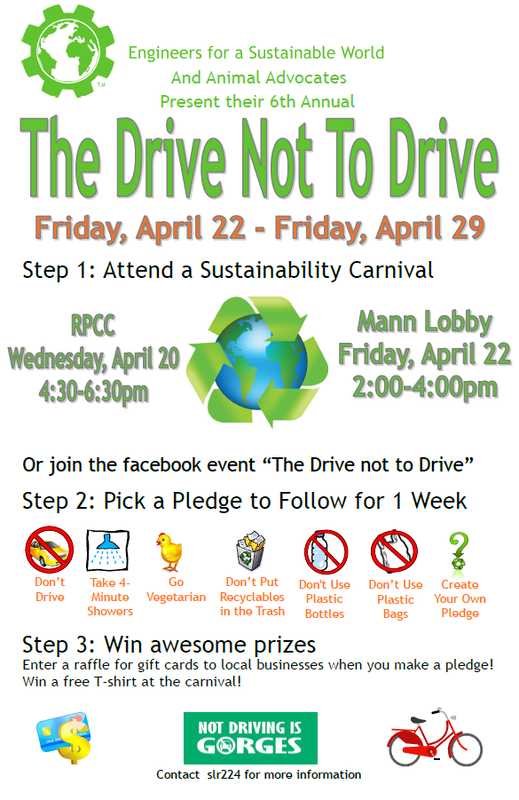 DNTD is a campus-wide "sustainability pledge" competition. NCRB is an electricity conservation competition among the freshmen dormitories. I enjoyed interacting with other students and expanding the club. I liked working with a group to generate new ideas and put them into action. One such idea was changing the scope of The Drive Not to Drive from just asking Cornellians to not drive their cars for a week to asking them to make sustainability pledges such as not eating meat or using plastic water bottles for a week in the Drive not to Drive. This idea quadrupled participation in the event from 100 to 400 students. Below, a poster I made for the event provides some more information about it.